Established in August 2006, Best Friends Pet Assisted Therapy is a non-profit, 501c3 organization based in Clark County in Ohio. Our membership is made up of the volunteer teams who visit facilities throughout the area as well as individual patrons and corporate sponsors who support the efforts of these teams through their donations. We value all members for their unique contributions and are grateful for the support and enthusiasm for our group. 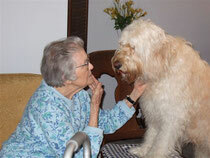 Being part of pet assisted therapy is an amazing and energizing experience for everyone involved from the patients and residents who benefit from the work of our dedicated volunteer teams to the pet parents and pets themselves who thrive on a genuine willingness to help those in need around them. It has often been said that in volunteering, we gain at least as much as those with whom we share ourselves. This statement aptly describes the feelings of our Best Friends—incredible people and pets doing incredible work to enrich the lives of others. Even before our charter members formed Best Friends in 2006, each team was individually committed to providing support and encouragement to patients and residents in area health care facilities and school settings. Coming together to form the group, these people and their pets along with subsequent teams who share our journey share a sense of purpose and common goals—to provide support and encouragement to area patients and residents, to raise awareness of this rewarding field and to act as role models for others interested in becoming involved in pet assisted therapy. Best Friends Pet Assisted Therapy strives to provide solid support for those teams who venture into the community with their pets to help others. In order to ensure that these volunteers are protected, we work with a national pet therapy registry that offers comprehensive liability to registered working teams. To help teams determine a good working environment, Best Friends volunteers work with these people and pets before, during and after the pet therapy registration process to locate an appropriate place where each team can attain their full potential. 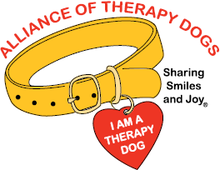 If you’ve ever thought about becoming involved in pet assisted therapy with your pet, if you work at a facility and would like to find out how to contact a registered working team or if you simply want to learn more about this rapidly expanding field, please feel free to contact us.